On Dec. 6 1916 an agronomist with the United States Department of Agriculture placed an order to Gordon Van Tine Company in Davenport, Iowa for two ready-cut houses no. 540 for shipment to the Kodiak Experiment Station in Alaska. Gordon Van Tine first offered ready-cut homes in 1916. From 1907-1915 the lumber was not pre-cut which meant cutting framing lumber by hand on site. I imagine having a pre-cut house where these were shipped was much easier to erect. 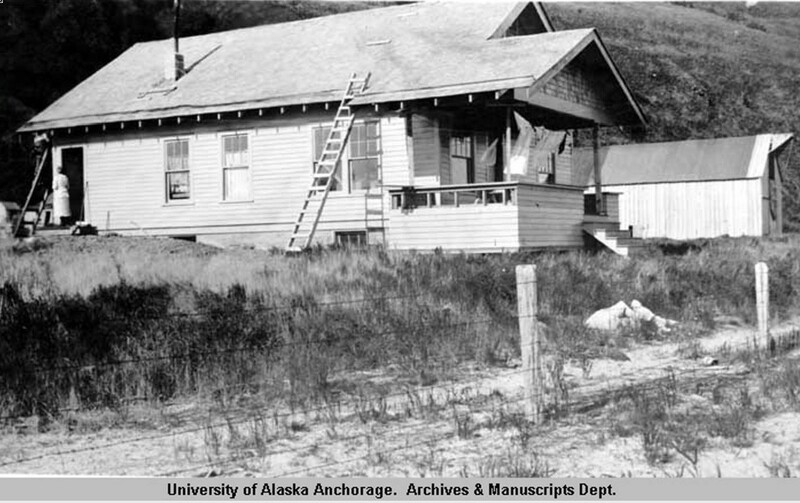 This photo is from the Alaska Digital Archives and was the foreman’s home at Kalsin Bay on Kodiak Island. Kalsin Bay was a branch of the Kodiak Experiment Station. The photo was taken during the National Geographic Society expedition on the way to Katmai area Sept 24. 1919. 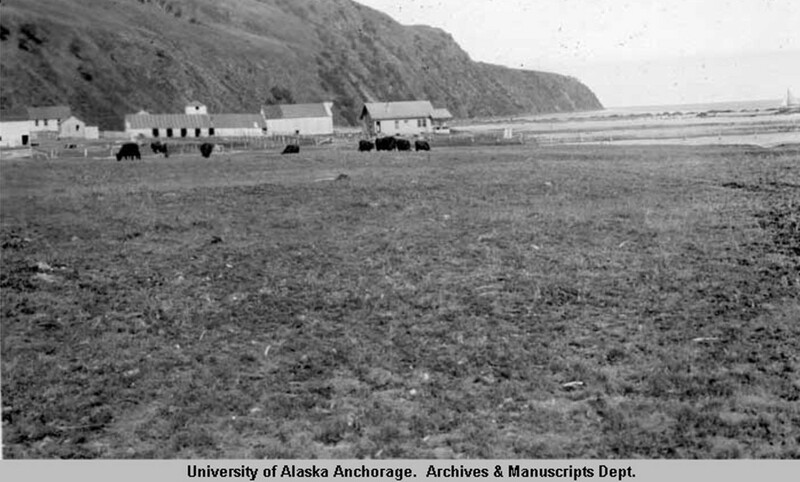 Agriculture Experiment Buildings at Kalsin Bay, Alaska. Photo is from the Alaska Digital Archives. The bungalow on the far right is the Gordon Van Tine 540 seen above. The foreman’s home. The sailboat seen in the distance is the Red Wing. It was transferred to the Bureau of Fisheries from the Department of Agriculture in 1926. You can see more here. And the bungalow was moved by barge to Palmer. We’ll see it later! This photo was taken during the 1919 National Geographic Society expedition to the Katmai area. 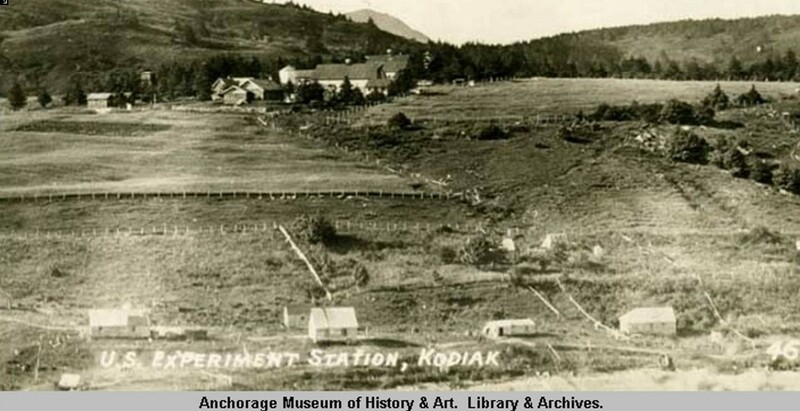 This is the Kodiak Experiment Station. You can see that the terrain is very different than that of Kalsin Bay. The distance between the two stations is 14 miles. This photo was also taken during the 1919 National Geographic Society expedition to the Katmai area. This is another view of the Kodiak Experiment Station bungalow, model 540, from Gordon Van Tine. I’ve not located this bungalow, yet. It’s M.I.A. right now. Hopefully, someone from Kodiak will solve that mystery! 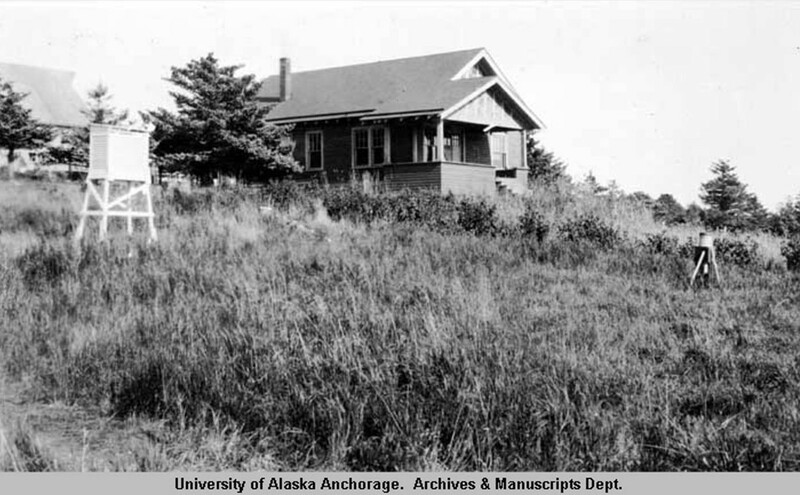 This image from the Alaska Digital archives was a post card contribution. This is the Experiment Station at Kodiak and the bungalow in the center is possibly the Gordon Van Tine 540 from above. This Gordon Van Tine 540 was the one built in Kalsin Bay. 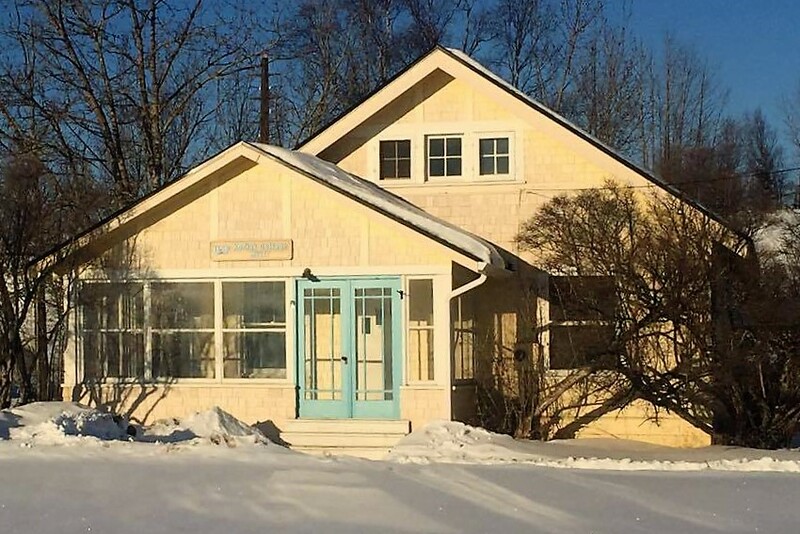 During my research I learned that this bungalow was moved to its current location when the Agriculture Experiment Station was closed in the early 20’s. It is now at the Sustainability Matanuska Experiment Farm in Palmer. I also learned that it is rumored to be a Swedish kit house. Surprise! It’s a kit home from Gordon Van Tine. The photo was taken by one of my Gamma Phi Beta sisters from Southwestern Oklahoma State University, Sherri Hart. Sherri teaches in Palmer and is finishing up her PhD in Ed Leadership! I really appreciate the photos and that she responded so quickly! The front of Kodiak Cottage, a Gordon Van Tine 540 shipped to Kodiak Alaska in 1917. I wonder what it looks like now inside? I have another blog on the 540 aka 522 which shows what the interior ‘should’ look like. Or, did at one time. You can see it by clicking here. Photo credit with MUCH appreciation to Sherri Hart. Thank you, sister! What happened to the bungalow at Kodiak Station? Is it still there? Was it moved as well? I’m hoping someone will know more. I’m also hoping that they are as excited as I am about this discovery! What a learning experience this blog was! I learned about the Agriculture Experiment Stations in Alaska. And, as a Tulsa County Master Gardener, I was intrigued with the ability to grow such a variety of vegetables and the size! There are three ways to contact me. By email: searshomes@yahoo.com You can contact me through Sears Modern Homes on facebook. Or, you can leave a comment below. To see a set of Gordon Van Tine blueprints click here! To learn more about kit homes and meet other enthusiasts as well as home owners join us in the Sears Homes Group on facebook! For more information on the Gordon Van Tine Company of Davenport, Iowa visit the website of Dale Wolicki , here. 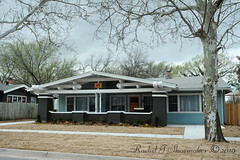 My friend Rosemary Thornton has featured several Gordon Van Tine homes on her blog. To see more Gordon Van Tine catalogs online click here. And, to see the beautiful covers from Gordon Van Tine catalogs click here. Come back for my next blog to see the Gordon Van Tine 122, one of their earliest models. I’m still polishing my GVT identification skills and knowledge right now. I’ve not forgotten you Sears or Aladdin. Coming soon, a Gordon Van Tine house, barn and poultry house with documention, order forms, correspondence letters, vintage photos, construction photos too! I’m gathering images and info now. 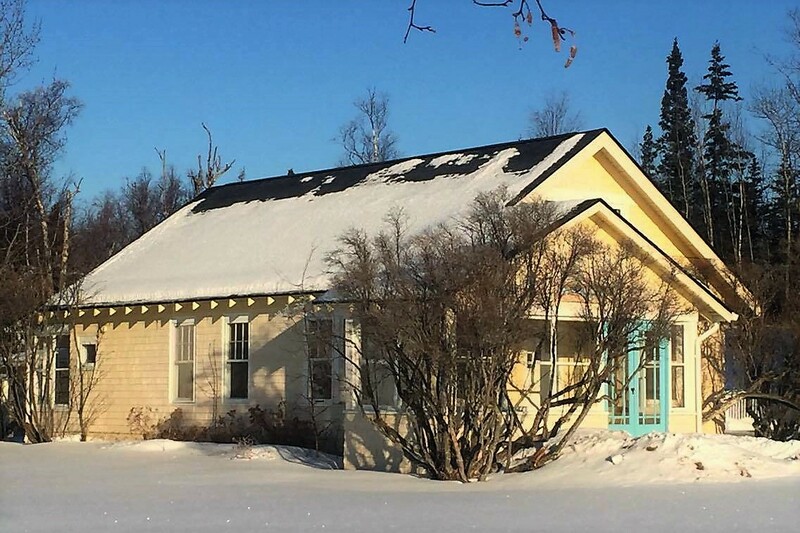 I have several awesome homes to share from blog readers, a Sears 119 in Iowa comes to mind, a Lewis Vitello that Mark Hardin found, a Henry Wilson bungalow in Nova Scotia that I identified for a reader. A Wardway Barcelona shared by a reader. It just never ends! I love hearing from readers. 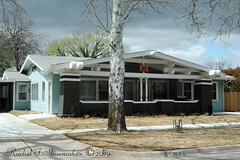 searshomes@yahoo.com Send me your homes and your questions. 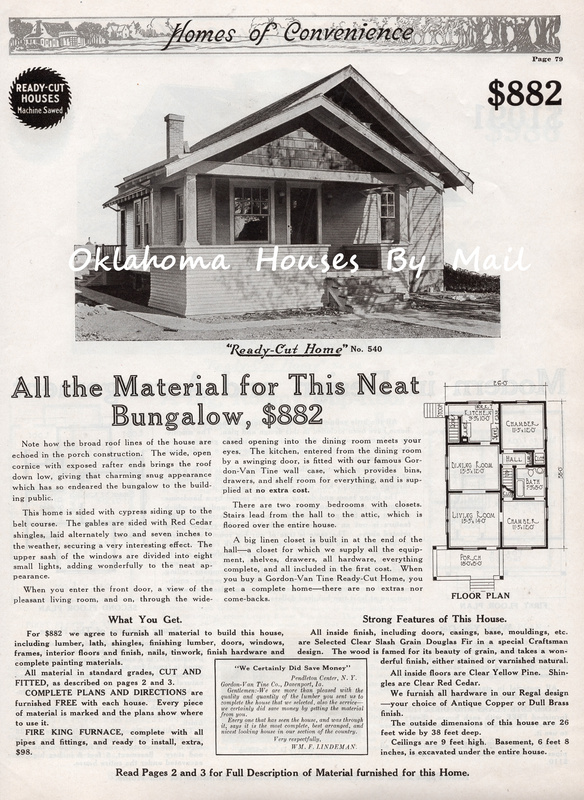 Oklahoma Houses By Mail by Rachel Shoemaker is licensed under a Creative Commons Attribution-NonCommercial-NoDerivatives 4.0 International License. 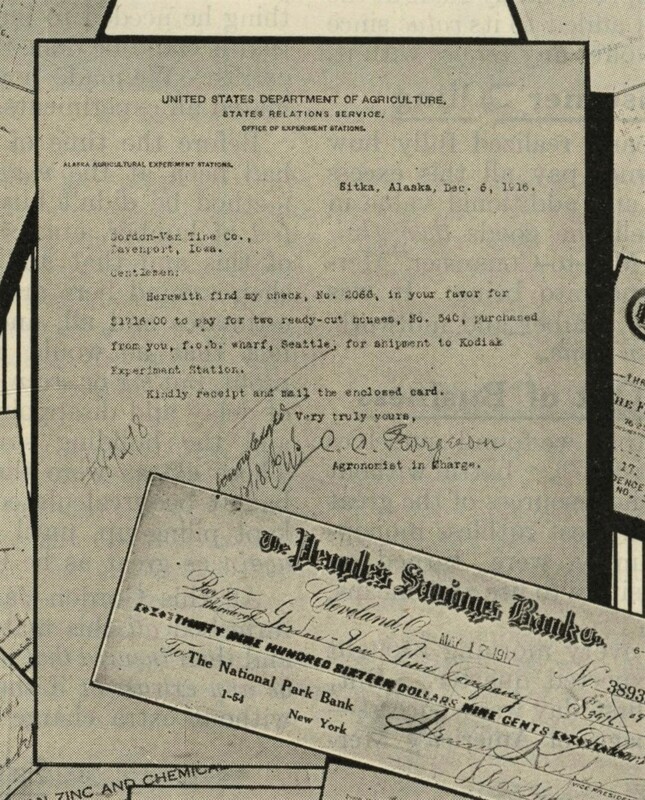 This entry was posted in Gordon Van Tine, Kit Homes Around the Country and tagged 1509 Georgeson Rd Palmer AK, Agricultural Experiment Station Kodiak Cottage Matanuska Trunk Road Palmer Matanuska-Susitna Borough AK, Agriculture Experiment Station Kodiak, Aladdin Homes, Aladdin Readi-Cut, Alaska Cold Climate Permaculture Institute, Alaska Colonies, Alaska Historical Society, American Foursquare, Bait and Catch, Bungalow, Bungalow Home, Catalog Home, Catalog House, Charles Christian Georgeson, Colony House Museum, Craftsman Bungalow, Craftsman Bungalow Plans. Cottage Plans, Craftsman Home, Davenport Preservation Commission, Davenport Scott County Iowa, Edward Roberts, Follow The Leader, Foursquare Kit Home, Gordon Van Time Inventory of Homes, Gordon Van Tine, Gordon Van Tine Davenport Iowa, Gordon Van Tine Homes, Gordon Van Tine Inventory of Homes, Gordon Van Tine Not Ready Cut, Gordon van Tine Ready Cut, Gordon Van Tine Sears house, Gordon Van Tine Standard Homes, Gordon Van Tyne, Gordon VanTine, gordonvantine.com, Hipped Roof, Hipped Roof with Dormer, Horace G Roberts, Houses By Mail, Kalsin Bay Alaska, Kerttula Hall, Kodiak Cottage, Kodiak Experiment Station Bungalow, Kodiak Experiment Station in Alaska, Kodiak Historical Society, Kodiak Station Alaska, Langeloth, Matanuska Experiment Farm, Montgomery Ward, National Geographic Society Expedition Katmai 1919, National Geographic Society Katmai Expedition, New Deal Colonies, Palmer Center for Sustainability Matanuska Experiment Farm, Palmer Historical Society, Prefab Homes, Prefab House, Rachel Shoemaker, Rosemary's Bulldog, Sears Archives, Sears Catalog, Sears Elmhurst List, Sears Farm House, Sears Foursquare, Sears Homes, Sears Homes Enthusiasts, Sears House, Sears House Alaska, Sears Kit Homes, Sears Magnolia, Sears Modern Homes, Sears Modern Homes Inventory of Homes, University of Alaska Experimental Farm, Vintage Cottage, Vintage Home Plans, Wardway, Wardway Homes. Bookmark the permalink.